The name Shakespeare emerges for the first time in connection with the London Stage on the title page of the second edition of Richard III, published in 1598, shortly after the first, anonymous, edition of 1597. After several years of anonymous publication, why did the name appear at just that time and on that particular play? We’ve been examining the phenomenon of Richard III from a political viewpoint, that of the war waged by Secretary of State Robert Cecil on the London Stage. What about the play itself? What can we learn from that? Albert Feuillerat, writing in the 1940s and into the early 1950s, made an exceedingly close study, word by word, phrase by phrase, of Richard III and several of the other earliest plays in the canon: Richard II, Romeo and Juliet, Titus Andronicus, and Henry VI parts Two and Three. The earliest to be published, they were also the first to bear the name Shakespeare. Feuillerat’s close attention to detail, to the meter and vocabulary of these plays, should command more respect than it does. That one hears his name so little is probably due to the fact that the results of his study tend to point in a direction uncomfortable for the Stratford biography, cornerstone of the academic cult. 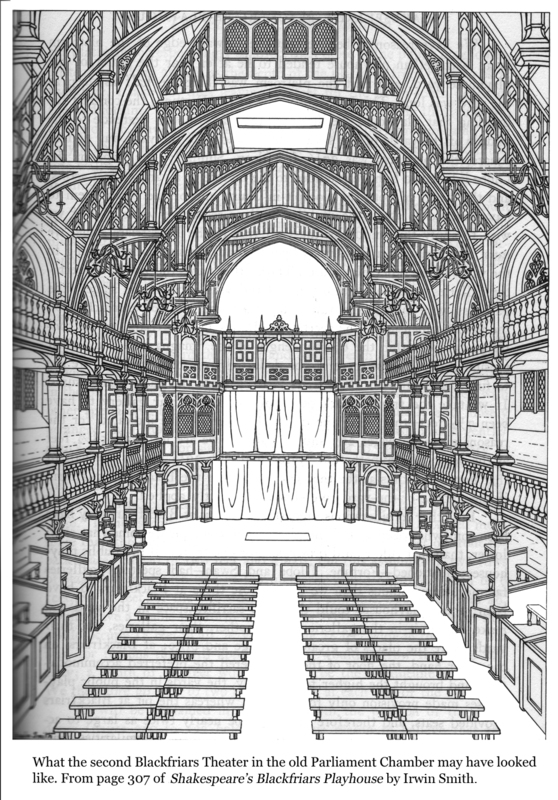 One of the things Feuillerat brings out that should be a central point in Early Modern literary studies is the obvious fact that the repertory companies had to revise their plays every so often to keep their audiences coming back, a logical perception that should put paid to the academic nonsense about “bad quartos.” Anyone with money can build a theater. Anyone with a little chuzpah can grab a cloak and spear and do a turn on stage. But not just anyone can write a play that holds an audience’s attention, particularly one that brings them back for a second or a third time. So the plays had to be refurbished from time to time so that the producer could advertise them as “newly augmented” and thus continue to use them to bring the audiences in. Of the six plays examined by Feuillerat, the three history plays have a further interest in that they’re closely related to a handful of anonymous plays known as the First and Second parts of The Contention between the houses of York and Lancaster, and The True Tragedies of Richard III and of Richard Duke of York. So perfectly do these fit the plots, characters, and much of the language of Shakespeare’s Richard III, Richard II, and the last two parts of Henry VI, that avoiding the inevitable conclusion that they are Shakespeare’s own early versions has required the kind of intellectual contortions that we’ve come to expect from the university English Departments. The simplest and easiest and most likely explanation would be that Shakespeare wrote them himself; where else in literature do we find early versions of works by anyone but the individual who wrote the final version? But because the Stratford biography has Shakespeare placed too late for that, some other explanation had to be found. It was in search of this that Feuillerat spent 30 years deconstructing these plays, both the early versions and Shakespeare’s. Feuillerat’s close attention to the language, meter, tropes, archisms, etc. of these plays, reveals that they display four separate and definite styles, each, according to him, easily distinguished from the others, and all of them most relevant to our thesis. Although Feuillerat makes no effort to affix dates to the originals by A and C, his descriptions suggest that those parts written by C may go as far back as the 1560s and 70s, while A fits better with the early 80s. And although he claims at the outset that he’s able to discern where author B has overwritten A, and Shakespeare all three, he confesses in several places that he’s not all that clear where Shakespeare and C are concerned, as both are fond of similar tropes. Nor does he make the slightest effort to identify any of the three, a significant ommission considering that he published several books and articles on Philip Sidney and also on John Lyly, whose dates, one would think, would make him a prime candidate for at least one of these hands. Worse than this is the problem his scenario creates of identifying authors A and C, whose plays were so dramatically sound that, despite their questionable versification and awkward archaisms, rather than let them go, the actors saw to it that they were consistently revised over time, with improvement to the language, but rarely to the structure, placing them first among the plays to be upgraded with the formation of the Lord Chamberlain’s men. It would seem that these two original authors deserve a place in English letters close to Shakespeare himself, if only we knew who they were. But of course we know who they must have been! One of the things that struck me when I first began studying these matters was the immense disconnect between the fantasy Stage of the orthodox imagination and the limited reality of the times. The size of the community that produced these first works of genuine literature does not allow for all the ghostly figures conjured up, first by the courtiers who used one phony name after another to get published, then by later historians who, like Feuillerat, have filled the record void with any number of brilliant if nameless writers. The earliest days of the Stage, and of the popular Press that published its plays, was an outgrowth of what the Elizabethans called May Games, the mummings and disguisings of the Middle Ages that turned a few weeks in the heart of the winter into a fantasy world of feasting, masquing and role-playing. The writers were simply distilling the ancient May Games into books, entertainment via plot and character compacted into little back marks on white paper, bound into a small package that could be taken on trips and read alone at night by candlelight, that is, by people who could read. May Games, mumming and disguising, were means by which a community trapped in its own hard reality could transport themselves into another world. Transformed by mask and costume into Faeryland, the Middle East, Africa, or, most often, Illyria, where, as Greek shepherds and nymphs they sang and played the lute surrounded by gods and goddessses. But when the party ended, and the mummers were unmasked, whom did they see but their same old neighbors? When Shakespeare’s audience demanded that the playwright be revealed, who was there to reveal? Let the names without biographeis, the authors A, B, and C, fade into the shadows whence they came. Let the masks come off. Of course authors A and C were the same individual who, having turned 40 and, faced by the need to provide another Crown company with modish material, perfected his own earlier plays, the earliest in the style Feuillerat calls author C, the history plays by the one he calls author A. And of course the “Marlowesque” author B could have been no one but Christopher Marlowe himself, who, brought to Fisher’s Folly by Walsingham in 1584, had been given the task of regularizing the meter of the Contentions and the True Tragedies for the benefit of his new company, the Queen’s Men, “the jigging mother wits” he scorned in Tamburlaine, with unrhymed iambic pentameter (aka blank verse) which had become, in the intervening decade, the industry standard. Thus, thanks to Albert Feuillerat, French Professor at Yale in the 1930s and 40s, we have another and extremely important piece to add to that puzzle, the Birth of the London Stage, of the Popular Press, of the Fourth Estate, of the British Media, call it what you will. Thanks to Feuillerat we have expert and thoughtful descriptions of Oxford’s voice from the early 70s, his voice from the early 80s, and Marlowe’s from the mid-80s. At some point we hope to take a closer look at his description of these voices. Those with a taste for intelligent word studies will find Feuillerat’s book of interest: The Composition of Shakespeare’s Plays, 1953. Some parts are available online for free, but there is a downloadable version for $10. 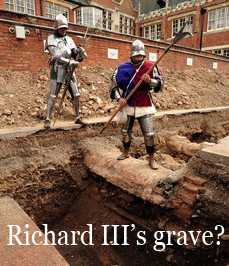 Note: Archaelogists may have discovered the skeleton of Richard III beneath a car park in Leicester. Wounds to the back and skull are relevant to those suffered by the King at Bosworth field. The spine shows evidence of scoliosis, though not of a hunchback. They hope to get an answer from its DNA. Readers new to the Authorship Question will quickly see that the Shakespeare story as I tell it is considerably different from the one told in school and from the one told (or, more precisely, clumsily and obscenely aimed at) by the movie Anonymous. So perhaps this is a good place to restate why I believe in the scenario I outline here. First, I agree with the majority of those who can see from the utter impossibility of the Stratford biography that the best candidate for what came to be called the Shakespeare canon is Edward de Vere, Earl of Oxford. While the rest may have a credential or two, he has them all. But after 20 years of studying the matter I can no longer think of myself as just an Oxfordian––I’m an authorship scholar, by which I mean that I now question the authorship of (almost) every single work of the imagination published during the Elizabethan era! To stop with Shakespeare gives the impression that he was an anomaly at a time when everything else was normal (according to today’s view of the world). That’s simply not the case. By today’s world of theater, writing and publishing, everything then was an anomaly. He was only part of it. Second, when you read Shakespeare here, understand that I mean the poet, not the man who sold him the use of his name. Because it was de Vere, not William of Stratford, who made the name famous, de Vere’s the one who deserves it. If I sell you my house, even if I rent you my house, if you make it famous as the place where something of great human significance occured, historically it becomes your house, not mine. The third thing I began to realize as I dug more deeply was how little evidence there was, not just for Shakespeare, but for anything relating to the origins of the English Literary Renaissance. There’s no argument about this; all scholars of the period are aware of the holes in their story, even if they don’t see how deeply or widely the lack of evidence extends beyond their particular focus. So if I was going to figure anything out, I was going to have to cast a much wider net than those who concentrate just on Shakespeare, or Sidney, or Marlowe, or the history of the London stage. Sooner or later I thought, I’ll find out what happened to all that evidence. And I have. I can’t prove it, not in the way it would take to overturn the Stratford monolith, not all by myself, but perhaps someday somebody will. Of course the answer was there all the time, the Baconians were the first to see it, parts of it, but finding out exactly how and when it happened has proven to be the final, central, determining piece in the scenario. As forensic scientists know, everything that happens leaves a network of clues that extend around it in time and space, so however much hard evidence is missing, there will be clues in the mainstream history, in biographies of those involved and of similar phenomena from other times and cultures. Current studies like that of the psychology of creativity have added important insights. And there are always the dates, that is confirmed dates, that function as linch pins for the sequences of events that create the network of clues that must take the place of the missing evidence. Dates of events seen as “coincidental”––events within a particular circle that occur at the same time or close to it but are otherwise unrelated––are just about impossible in the small world that was the 16th-century London stage, periodical press, and Royal Court. That such events are unrelated is so unlikely as to be impossible. Fourth, I came to realize how very different life was then from what it is today. While the subliminal backdrop to our view of literature and entertainment today is of hundreds of writers publishing hundreds of thousands of books by thousands of publishers and thousands of films made by hundreds of filmmakers written by hundreds of screenwriters, whose names change on a weekly basis as tens to dozens join the ranks or fall by the wayside, most of whose names mean nothing to anyone but their close associates (think of the long roll of credits that follows every film)––we must force our imaginations to provide a scenario where where there were two or three playwrights, six or seven professional-level actors, and seven or eight printers and publishers, all of whom knew each other or were at least very aware of each other’s existence over many years. In other words, the illusion that Philip Sidney existed apart from Christopher Marlowe, Bacon apart from Nashe, Mary Sidney apart from Bacon, or any of these apart from the man considered by one of orthodoxy’s favorite supports, Francis Meres, to be “best for comedy” during the 1590s is just that, an illusion created by a lack of evidence. If I live two blocks from a bakery, do we need an affadavit to prove where I buy my bread? These people knew each other, had relationships with each other, relationships that drove the story of the blaze of literary splendor that was the English Literary Renaissance. What was that story? And why is it so obviously missing from the record? As an historian, I can’t go beyond the constraints imposed by these limits. There were very few individuals during the early years of the English Reformation who could write engagingly in the 1560s and 70s, even fewer could or even wanted to get their own work produced or published, and as for those who could put on a risque and satirical play for the public and get away with it, the list narrows to one, however difficult it may have been all these centuries to identify him. As for style, themes, and subject matter, biographies of other geniuses require that there be one Shakespeare and only one. Just as no two people could have painted the Mona Lisa and no two people could have conquered Asia in the 3rd century BC, no two writers could have written (or co-authored) Romeo and Juliet or Julius Caesar. There was, there had to be, only one da Vinci, only one Alexander, and only one Shakespeare. 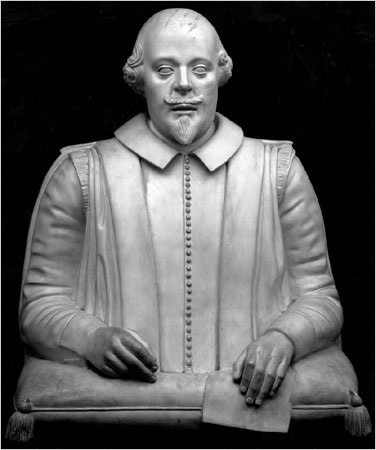 Since all the other world-creating geniuses were leaders who left their arenas of endeavor permanently altered, causing those who came after them to imitate them, so the author of the Shakespeare canon must have been a man of great respect and high standing in the small literary circles of his time, and he had to have been born early enough that lesser writers who dealt with similar themes and subjects and whose styles show similarities to his, were his followers, and not he theirs. That Shakespeare could possibly have imitated the lesser writers of his day, that he rewrote their works, is a cart-before-the-horse fantasy created by left-brainers who simply do not understand the nature of the thing they write about. Yet it’s also true that great peaks in artistic endeavor are almost always driven by groups. To develop, artists must have an audience on a level equal, or almost equal, to their own, colleagues who appreciate them, rivals who challenge them, enemies who drive them to retaliate. Think of the French Impressionists, the Scribblerus Club, Bebop, Motown. The films Ocean’s Eleven and The Seven Samurai have plots based on a group of talented individuals that come together to accomplish some goal. But there’s always, there has to be, one or sometimes two, central figures. The problem for the Elizabethan era is that the central figure is missing. Some have tried to make it Sidney; others have tried to make it Bacon, or Marlowe, or even Mary Sidney, but in every case, while a few things may click, too many do not. Those clicks are important, but it’s the collegial relationship with Shakespeare that they represent, not the poet himself. With Oxford at the center, they all fall into place: Philip Sidney, a great writer, four years his junior, his first and most challenging rival, who refused (or was simply unable, largely for political reasons) to follow him into the theatrical arena, and whose own achievements pushed him more than once to go beyond himself; his cousin Francis Bacon, his partner in many ways and the second most important figure in the story, who eagerly followed him until he (Bacon) got the Court job he’d been striving for from the beginning, defended him during his hard times, and helped to edit his collected works after death; Stephen Gosson, an early neophyte who, like Marlowe later, betrayed him early on, selling out to the Bishops who were trying to shut him down; Lord Strange who, egged on by Leicester, was trying to replace him as the Prospero of the London stage; Mary Sidney, who in his life loved and hated him, and after his death, helped save his work for posterity; and Christopher Marlowe who studied with him, adopted his style, rebelled against him, and foolishly refused to listen to his warning. With Oxford as author the lives of the others involved at that early stage in the English Literary Renaissance also fall into place: the actor Edward Alleyn, whom he trained to play his youthful protagonists, and who deserted him to work with Marlowe; the secretaries whose names got attached to his early works: Anthony Munday, John Lyly, and Thomas Kyd; his friends from college days: the Catholic apologist Richard Rowlands, aka Richard Verstegen, and George Pettie, whose name he borrowed for two of his early works; the Bassanos, the Court musicians whose talents graced his early productions; their sister, the poet Emilia Bassano Lanier whom the world knows as the first feminist in English Literature and sees as the Dark Lady of the Sonnets (and most certainly Cleopatra); the patrons whose protection allowed him to continue to write under increasingly difficult circumstances: the Earl of Sussex, Sir Francis Walsingham, Lord Hunsdon, Lord Admiral Charles Howard, the Earl of Southampton, the Earls of Pembroke, and (to some extent) both monarchs. Also clear are the enemies who appear in several plays as villains: his cousin Henry Howard, later Earl of Northampton, who trashed his reputation, and his brother-in-law, Robert Cecil, later Earl of Salisbury, who used the power bequeathed him by his father, Lord Burghley, to destroy the evidence of his leading role in the great literary revolution that the Cecils were so determined to quash. With Oxford as author, no falsification of evidence, no forced rearrangement of dates, no ignoring of documents, no overblown imagined scenarios, are required for all of these to fall easily into place around him. The biographies of other great literary lights lead to the conclusion that despite what they may pick up here and there from their reading, all great writers, particularly poets, draw primarily from their own experiences for their major works. Writers, great writers, write as a means of emotional catharsis, to explore an issue that affects them deeply, a philosophical dilemma that demands resolution, a situation that demands the truth. Theirs are the pearls of literature, surrounded by the art of a creature irritated into self-protection. The themes that they explore, particularly those they explore repeatedly, will always connect to something in their biographies. The fact that so much of what Shakespeare wrote about fits the life of the Earl of Oxford requires either that he was someone very close to Edward de Vere, or, pace Bishop Ockham, that he was Edward de Vere! Further, the fact that nothing in any of his works suggests the scenario crudely attempted by the film Anonymous demands that the real story, involving all these writers, a story far closer in nature to a spy thriller than this absurdly ahistoric soap opera, get its day in the court of public opinion.